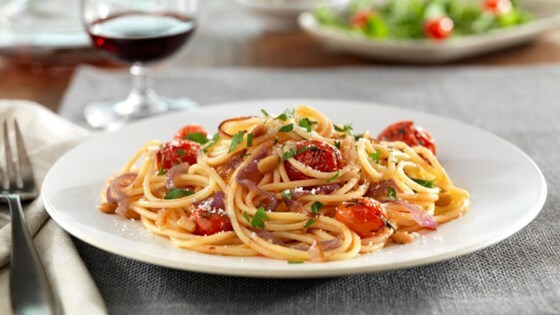 "A delicious summer pasta with gluten-free spaghetti, caramelized onions, and oven-roasted cherry tomatoes is tossed with toasted pine nuts and grated cheese." Pre-heat the oven to 425 degrees F (215 C) and bring a large pot of water to a boil. Toss the cherry tomatoes in 2 tablespoons of olive oil and season with salt and pepper. Place on a sheet tray and roast in the oven until blistered and browned. Meanwhile, in a skillet caramelize the onions in 2 tablespoons of olive oil, season with salt and pepper, and cook over medium heat for about 10 minutes. To the skillet add the roasted tomatoes. Cook pasta according to package directions, reserve 1 cup cooking liquid. Drain and toss with sauce and cooking liquid, stir to combine. Remove from heat and add toss in the parsley, cheese and pine nuts.